Penn is history's best no. 16 seed. Can it pull off the NCAA Tournament's greatest upset? This story originally appeared on FiveThirtyEight and is reprinted with permission. There are only a few things left in sports that have never happened: five homers in a game, a sub-two-hour marathon, a quintuple double. Probably the most famous, though, is the knocking off of a No. 1 seed by a No. 16 seed in the men's NCAA Tournament. (A 16 vs. 1 upset has happened once on the women's side, when Harvard beat Stanford in 1998.) It's actually kind of weird that it hasn't happened yet; although No. 16 seeds are usually pretty bad, you'd think at least one would have broken through over the course of 33 years and 132 tries. The 133rd No. 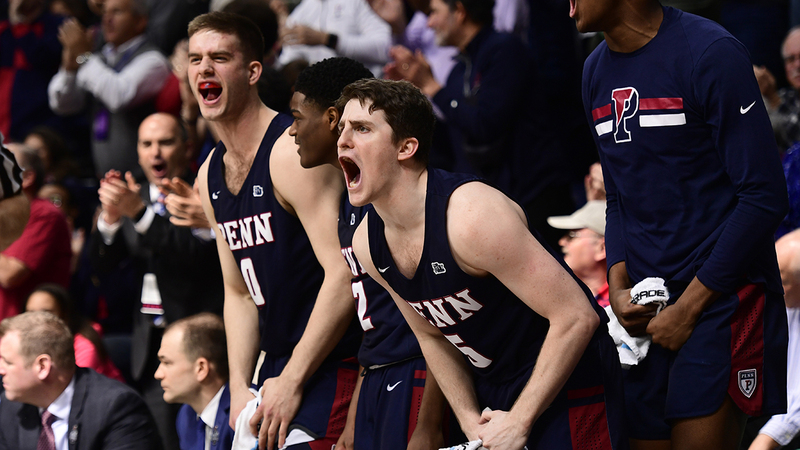 16 to take a crack at it will be the Ivy Leaguers from the University of Pennsylvania, which faces Kansas on Thursday - and Penn's chances of beating a No. 1 are among the best a No. 16 seed has ever had. Of course, even if Penn is the best No. 16 seed ever, the Quakers aren't playing another No. 16 seed on Thursday; they're playing Kansas, which just earned its 14th No. 1 seed in program history. KU has wiped the floor with No. 16 seeds by an average margin of 25 points per game, with only one (Western Kentucky in 2013) keeping the final score within single digits. One piece of good news for Penn, however, is that this year's Jayhawks aren't quite as strong as they've tended to be in their other top-seeded seasons. With an Elo of 1985, Kansas is well below the historical average (2071) for No. 1 seeds in the 64-team-bracket era. Only nine other No. 1 seeds have had a lower pre-tournament Elo in that span than KU has this season. So Penn-Kansas might be the perfect storm we obsessive 16-over-1 hopefuls have been waiting for: a combination of the best No. 16 seed in history and one of the weaker No. 1 seeds. 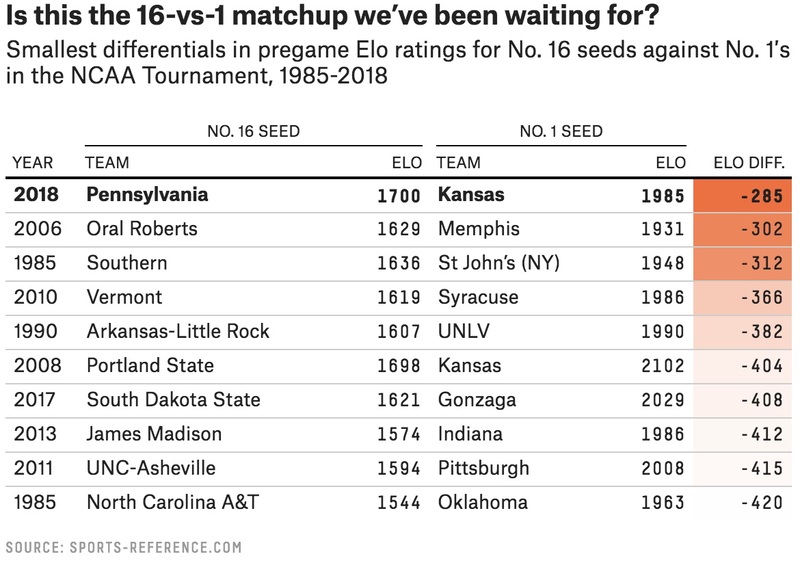 According to Elo, the 285-point gap between the Quakers and Jayhawks is the smallest for any 1-vs-16 game in tournament history. There is one big catch, however. The game will be played in Wichita, Kansas, just two-and-a-half hours down the road from the Jayhawks' campus in Lawrence. 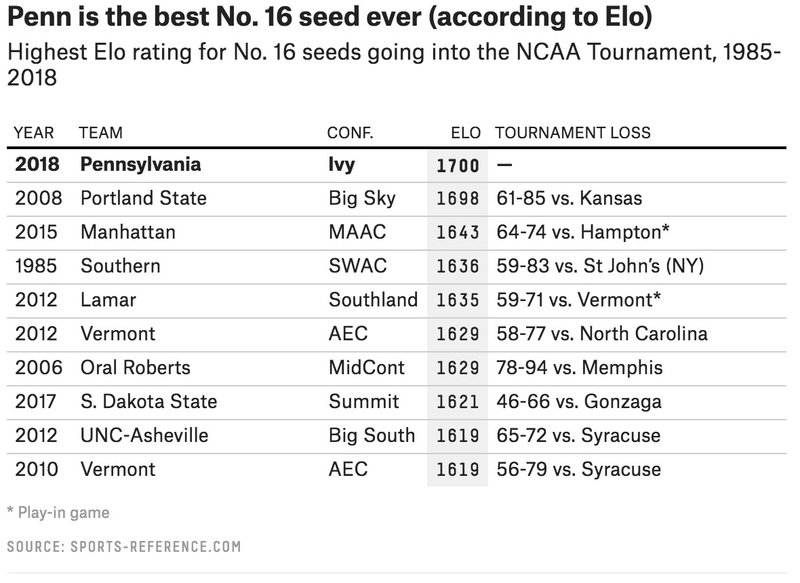 Because our full-blown tournament model - which contains many accuracy-boosting bells and whistles that pure Elo differential ignores - takes travel distance into account, it gives Penn only a 5 percent shot at the historic victory. That's still really high by 16-seed standards - the best chance since the current iteration of our model rolled out in 2013 - but comparing that to the typical No. 16's win probability is like saying the Cleveland Browns had a better winning percentage in 2016 than in 2017. Sure, it's true, but neither number is especially good. In other words, the Quakers probably won't win. Unlike practically every other 16-vs-1 matchup, though, this one should give you a millisecond of doubt when filling out your bracket. We always say that, eventually, a No. 16 seed will beat a No. 1 seed. For Penn, there might be no time like the present.